Why would anyone want to make their own laundry detergent? The simple answer is money. The cost savings are significant. It costs about 20 cents per load using name brand detergent purchased at Wal-Mart. It costs less than 3 cents per load to make your own. In a home where two or more loads of laundry are being done every day this ads up quickly. Let’s say the average house does a conservative 10 loads per week. That’s $2 per week, or $8 per month on laundry soap. Making your own will chop this down to about $1 per month. Total laundry soap made with the above ingredients: 1536 ounces. At 4 oz per load = 384 loads. $11.26 / 384 loads = 2.9 cents per load. All these materials are available in the laundry aisle of your local food store. These numbers are actually VERY conservative. 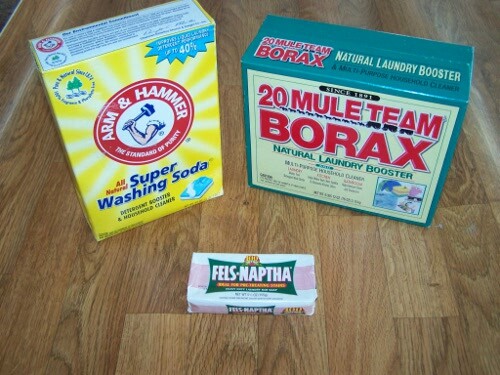 The washing soda and borax will last much longer than the 1536 ounces of detergent in this example, but I wanted to draw some kind of simple comparison. It only takes about 20 minutes to make 2 gallons of liquid laundry soap. Why would a thrifty consumer NOT do this? Add six cups of water to a large pot. Grate or shred the fels naptha (1/3 bar) into the water and heat the mixture until the soap melts, stirring constantly. I use our food processor to grate the soap. The soap is very hard and doesn’t grate easily on a hand grater. Once the initial solution is dissolved, add the washing soda and borax to the pot. Continue stirring constantly. When all is dissolved, remove from heat. Pour 4 cups hot water into a bucket (I use hot tap water). Pour the soap mixture into the bucket and stir. Now add cold water until you have two gallons total in the bucket. (I mark the bucket ahead of time, using a milk jug to measure out a gallon of water from the tap). Now, I stir the 2 gallon mixture and pour it into my waiting empty laundry detergent bottles (I picked some up at the local recycle station). Shake before use. You should use about 1/2 cup per load. This recipe does a pretty good job washing our clothes. We’ve been using this detergent for about two years now and have been very happy with the results. How to make laundry soap from Frugalberry.com on Vimeo. Don’t forget to check out our other money saving tips!